Northern Heritage has always been very cautious of signing bands. We do receive promo mails all the time, but as many times stated, bands have never been signed based on promo mails they send to label. Most often bands are merely responded with blunt oneliner in style of “Northern Heritage is not seeking for new bands to release”. This is truth, but sometimes one finds things one was not looking for. 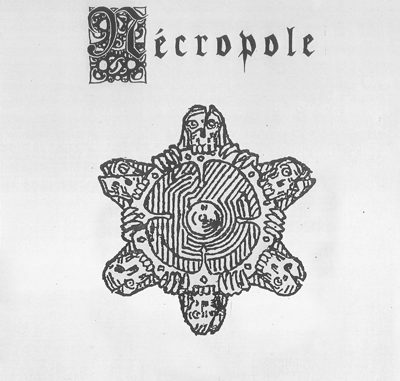 When I heard the demo tapes of French band Nécropole, it wasn’t originally sent to me as promo to consider to sign on label, it was in distribution among thousands of other titles. When listening this tape, it gave instant feeling of something being there. Something which is not very easy to explain, but what instantly sparked emotion suggesting there is something more than just one more band in endless stream. In theory, what Nécropole offers, is *just black metal*. In times when branding and gimmicks reign, it is refreshing to hear good black metal which doesn’t aim to fit to any subcategory. DSBM, NSBM, Religious BM, Bestial BM, Post BM, Shoegaze BM, etc. Instead of followers of some category or aesthetic dogmas, they trust in power of basics. Power of good songs based on catchy melody and excellent execution. Always stripped down of any gimmicks. Only offering the melancholic and cold melodic riffs on top of intense fast forward hammering of drums that are there only to serve needs of minimalist cold atmosphere. I personally appreciate very much that songs have strong pace onwards instead of a lot of metal that goes nowhere or can’t decide direction and jump to every direction. Best of onwards attacking material doesn’t indicate quality of rock’n’roll in traditional sense. Flow of Nécropole is cold and grim, filled with disgust and hatred, but also yearning for mythical noble ideals. Poetic French lyrics may be obscure for most people and it would be impossible to translate ones native expression to generic English. However, music itself speaks the language where one could sense beyond words. Linked song is chosen simply because it is the shortest track of this 6 song LP/CD. One could easily check any other song from the two magnificent demo tapes “Atavisme…” and “Ostara”. Nécropole s/t includes all songs from the above mentioned two demo tapes. Find also t-shirt from the store.